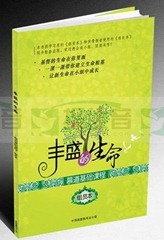 Abundant Life is a Chinese Bible study curriculum designed for new believers in the church. It is widely used not only among Chinese churches in America, but also among patriotic churches and house churches in China because it’s officially published by TSPM (Three-Self Patriotic Movement, the organization sponsored by the communist government to oversee all patriotic churches) headquarter in Shanghai. In North America, the author requires that only leaders trained by them can use the curriculum as a teacher. But due to the large number of churches in China, this requirement cannot work thus they published has both student’s workbook and teacher’s manual in People’s Republic of China. The author is anonymous, but many people believe it’s written by Rev. Zongqing Chen who is now the president of Blessing Cultural Mission Fellowship. This curriculum is designed to help new believers in the church to learn Christian faith through 18 modules, starting from “What is a new life” till “Guided by God”. It covers basic doctrinal topics like repentance, faith, obedience, Bible, prayer, baptism, communion, church, etc. The author expects this curriculums being used in a Sunday school setting with committed students, or in a one-on-one based discipleship setting. The Chinese church that I’m currently attending on Half Day Road is using this curriculum in Sunday school and some cell groups. I’ve attended the class for more than 10 times. Majority of the questions are asked by the leader based on the homework assigned on the workbook. Almost 90% of the questions prepared on the workbook are closed questions, along with 10% open questions in the application section usually being put at the end of each module. Moreover, all questions fall into the Bloom’s category of either remember, understand, or apply. The table below is a typical set of questions asked on the 4th lesson: Obedience. #1. According to Romans 14:9, what role does Jesus want to be in our life? #1 in Conclusion: how shall we obey God? Discussion: What else could be the lord in our life? Students might also raise question during the class. For example, one asked, “If I want to buy an IPhone 5 and ignore the need of the poor, am I led by my flesh and earthly desire?” However leader may stop this question from going too far from the core teaching of the class. While being asked about close or remember/understand questions, the leader expects student to directly hit the standard answer provided in the teacher’s manual. However, because the questions in the workbook are designed too shallow (or simple), it’s natural for students to think out of box and raise scenarios that might justify an exception. The students are all adults and 1st generation immigrants. They do have a lot of life and career experience. While talking about “obedience”, they will start to think of scenarios in their life that is hard to obey God or requires sacrifice to obey God. These scenarios triggered some hot discussions. However teacher is not prepared to take difficult case discussion, thus many discussions were stopped prematurely by the teacher in order to finish the lesson on time and get away from the embarrassment. To deeper the cognitive learning, I think it’s important to use real case from real world in adult’s learning experience, and incorporate their feedback in the development of the case to let the students realize that they contribute, influence and lead the study experience. It means that we not only provide a case, but also edit the case together with the students to reflect the struggles in their obedience to God in their real life situation and help them to better understand the meaning of being obedient to Christ in Christian life. Following questions can be asked to further the cognitive learning of the students. 1. Deepen Understand: List everyone and everything that has dominated or controlled your life. It could be a habit, a person, a stuff, etc. Why you think he/she/it was your “lord” during that period of time? This question would help the students to understand what a “lord” in our daily life could be and how we had sinned against God while we don’t know Christ. 2. Analyze the text: According to Romans 14:9 that we have read, what’s the prerequisite of Christ being our Lord and why? This question connects the cognitive understanding with the careful observation and analysis of the Scripture. It can help avoid jumping to the conclusion too quickly. 3. Apply through a case: We might need to design a case in which a person is struggling to obey God. The most common situation in the North American Chinese church is when the Christian faith has conflict with Chinese cultural tradition. We can design such a case and ask students what they think a Christian should do to obey God in such situation. In order to not over-simplify the problem, we need to mention that Bible also teaches us to obey, honor and respect our parents. 4. Evaluate the situation: We can use some extreme cases in the case study to encourage people to evaluate, reflect and learn critical thinking. For example, we imagine a Chinese Christian criticize parents while being asked to worship ancestors, or a case when a Christian who joined the ancestor worship without hesitation, and then ask the students what’s wrong with the two responses to the ancestor worship. 5. Create a scenario. By creating a scenario through individual assignment or group discussion, we can involve the students into the curriculum development. I may assign 10 minutes to each group to work out a case in which people might have struggle to obey Christ, and the case must be from their daily life experience. I found that many Chinese Bible study curriculums are still staying at the basic level of cognitive learning in their question design. They mainly focus on memorizing verses and bring out definitions and conclusions. We still have a long way to go to bring a comprehensive, exciting and effective learning experience to Chinese believers.